The term Biophilia is being used more and more, but what does it mean. How does it affect our lives? And where do we see it in our world today? By definition Biophilic design “integrates nature and natural elements, materials and forms into architecture and interiors.” Ok so that’s not so bad, some people have house plants, some people incorporate design schemes that mimic nature in their homes and offices, and others don’t have the luxury of a natural home esthetic or work in offices/buildings that are plain and stark. Personally I spend a lot of time in nature and work in an industry that is inherently apart of biophilia, but even I can still benefit from a greater use of biophilia around me. We all benefit from biophilic design. Any one person when given the choice between a room with a chair and white wall and a room that has a tree, a living green wall, a water fall, and/or architecture with curves or some sort of natural design scheme will choose the later. This is a drastic example, but proves the point. We inherently gravitate toward “natural” surroundings and our mind and body does not thrive in stark environments. Don’t believe me, spend a night or weeks in a hospital, mental ward, or jail and you might understand exactly what I am saying. Just being in an area with a direct access to nature can ease stress, enhance focus, increase mental stamina, and promote recovery from mental fatigue. That being said even looking at pictures of natural surroundings can ease the mind….im sure you have seen a poster or two with motivational words and nature scenes! Where do we see biophilia in our world today? 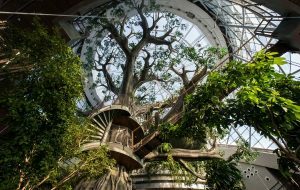 You can probably answer that question yourself when looking at the two basic dimensions of biophilic design. The 1st is organic or naturalistic, which includes the forms and shapes in the man-made environment that reflect our inherent human attraction to nature. This can be seen when design incorporates natural patterns or enhances a structure to incorporate or mimic natural surroundings. Examples would be lines or curves in architecture or large windows in buildings that give way to views of the natural world. The 2nd dimension is the place-based or vernacular dimension, which includes landscapes or buildings that connect to culture and sense of place. Within these two dimensions of biophilic design there are 14 patterns which are: visual/ non-visual connection with nature, non-rhythmic sensory stimuli, thermal and airflow variability, presence of water, dynamic and diffuse light, connection with natural systems, biomorphic forms and patterns, material connection with nature, complexity and order, prospect, refuge, mystery, and risk/peril. 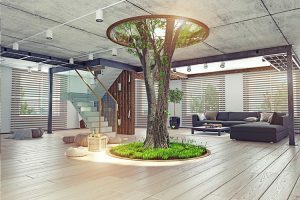 The goal of biophilic design is to reestablish a connection with nature in order to promote a positive change in the behavior of humans and the many negative impacts that we have on the planet today. Nature and the human process seem to be working against one another, and further understanding this relationship will allow us to incorporate natural elements into a space to positively change personal well-being and our interaction with nature. We do not know the future effects that biophilic design will have on our society as a whole, but we do know that the use of biophilia in our urban surroundings can increase personal wellbeing and foster a better connection between humans and the planet. It is no secret that our actions have taken and will continue to take a large toll on the planet. If we make a conscious effort to make small changes we will then see larger changes down the road. In the end it will be up to us to forge a stronger connection to our natural surroundings, which can being with a greater use of biophilic design.